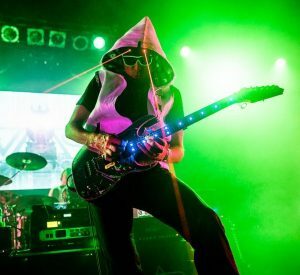 I have been to at least two Steve Vai concerts before this one I review down below. 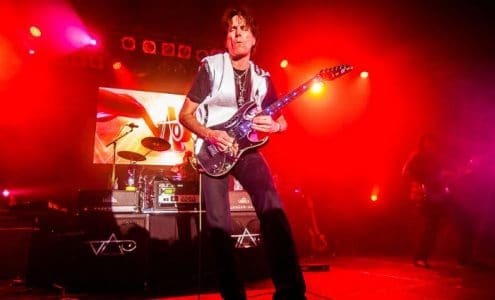 Each time, I have to say, I was more impressed, and the cycle continued with Vai‘s show at Warsaw’s Progresja Music Zone on the 20th of June 2016. 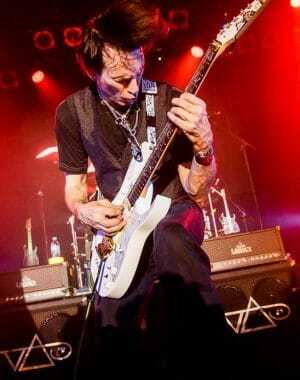 This one was commemorating the 25th year anniversary of Vai‘s breakthrough Passion And Warfare album. 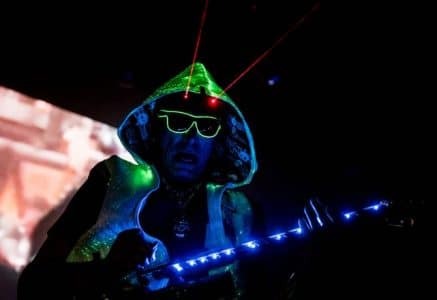 The concert started pretty much on time — maybe a few minutes late — and in came the main man, dressed in a silver hood, with red lasers flashing. He really looked like a being from a different time and space. And then the music only proved this right. And the show was about to be a bag full of surprises! A big one was a cameo by Queen’s legendary guitarist Brian May, who joined Vai on “Liberty”, which is the opening song from the Passion And Warfare album. If that would not be enough, the audience got treated to another cameo this time by Vai’s former teacher and fellow guitar god Joe Satriani, who joined in on “Answers”, and Dream Theater’s John Petrucci who teamed up with Vai for “The Audience is Listening.” These cameos albeit only on video screen still made an impression. You could easily say it was a very star studded show. A chance to see so much great guitar playing at one place really does not come very often, especially in my country. This really blew my mind, as I am a fan of all these musicians, and to see them all onstage in a short amount of time (for the price of one ticket) was quite a surprise and treat. 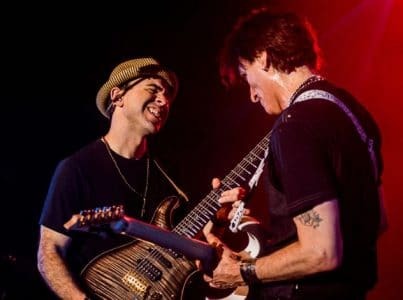 Another highlight of the show was that, as everyone who attended Vai’s show knows, Steve likes to fool around with the audience, to an extent even of inviting them onstage, and playing some games with them. It was nothing new to me, but again this time, he decided to invite some people onstage. Then when he already had his prey on hand, he asked them to hum some bass, some drum, and some guitar sounds, and based on that, he basically built up a song from scratch. I should not be surprised as I already seen him doing that a few years back, but I must say that putting a song like this, just like that — and a good sounding song I should add — is pretty impressive. This tune led to a extended jam, which only proved that Steve picked some A-list musicians there. 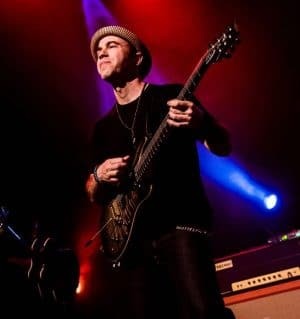 I got to say the band compromised of drummer Jeremy Colson, bassist Philip Bynoe and long-time (16 years) Vai partner in crime Dave Weinera, was very tight during the performance. Seeing them improvise, I got to hand it to them that they are also a group of versatile, open minded and really skilled musicians. The long, almost two-hour long show, packed with great music and aforementioned surprise guest performances ended on a very high note — a part of “Fire Garden Suite IV – Taurus Bulba”, which in my opinion is one of Vai’s peak artistic moments. The only downside I have to say was the sound quality, especially the over done bass and drum sounds. This came to me as a surprise, as Progresja is known for its good acoustics, and they usually do not let such mishaps happen. Apart from that it was a very cool, satisfactory show. Uploaded by David Hoffman on 2016-06-20.